Locality: Bear Lake Diggings, Bancroft area, Ontario, Canada. Link to MinDat.org Location Data. Name Origin: Named for the dominant B-site cation, niobium and for the aeschynite group. 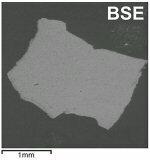 Comments: BSE image of a nioboaeschynite-(Y) grain. (CanMin, v46:395). Location: Bear Lake Diggings, Bancroft area, Ontario, Canada. Scale: See Image. Color: Deep brownish black, Black. note: Specific Gravity of Nioboaeschynite-(Y) =5.68 gm/cc. Nioboaeschynite-(Y) is Radioactive as defined in 49 CFR 173.403. Greater than 70 Bq / gram. Estimated Maximum U.S. Postal Shipping Size (10 mRem/hr limit, Unshielded 10 cm box) 115.79 ± 28.95 grams of pure Nioboaeschynite-(Y) .